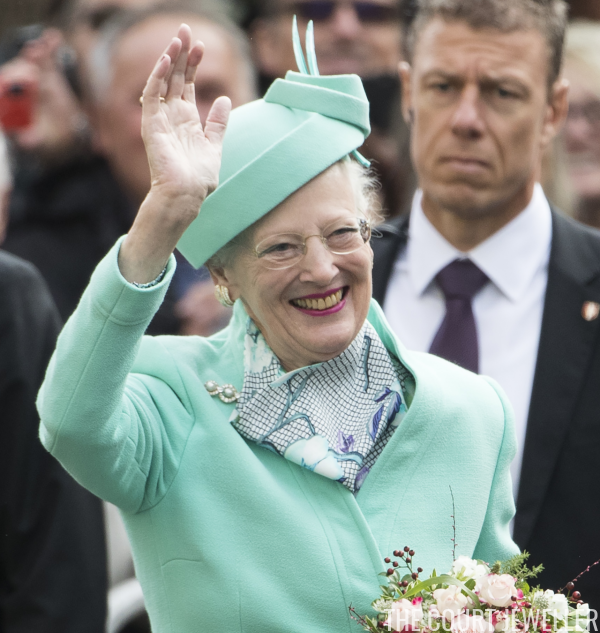 Queen Margrethe II of Denmark visited Germany this week to attend the reopening of Wittenberg's refurbished castle church. Wittenberg is particularly significant because it's the place where Martin Luther lived, preached, and started the Protestant Reformation. For the German visit, Queen Margrethe wore one of the most significant heirloom jewels in her personal collection: the Connaught Pearl Bar Brooch, a piece that has German roots. 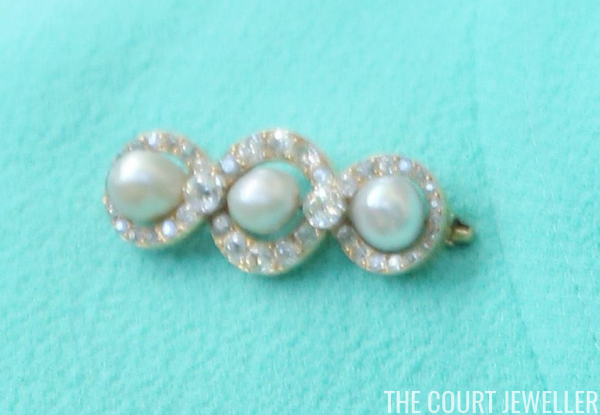 The brooch is made of three natural pearls set in diamond clusters. An additional diamond is set where the rings join. The piece originally belonged to Margrethe's great-grandmother, the Duchess of Connaught, who was born Princess Louise Margaret of Prussia. I love unusual viewpoints on royal jewels, and I thought this side view of the brooch gave a unique perspective on both the shape of the pearls and the detail of the setting. 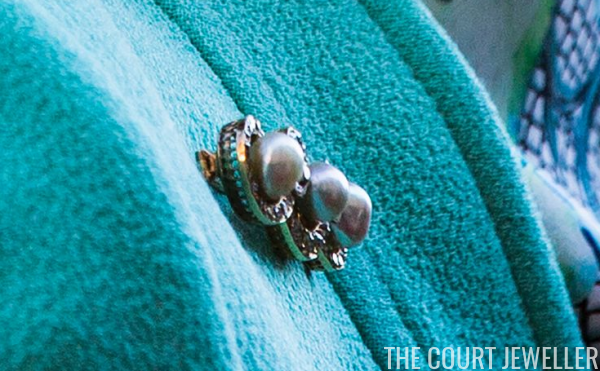 Margrethe has had this brooch in her collection for decades. The Duchess of Connaught bequeathed it to her younger daughter, Princess Patricia (later Lady Patricia Ramsay). Patricia gave it to her great-niece, Margrethe, as an eighteenth-birthday present. 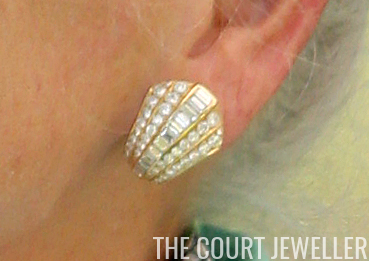 It's a truly classic piece, and it's no wonder that Margrethe wears it regularly. 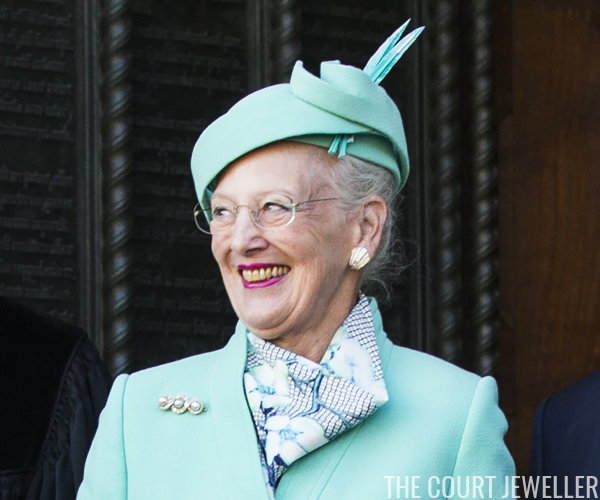 With the Connaught brooch, Margrethe wore a pair of glittering statement earrings. You can see a close-up detail above. 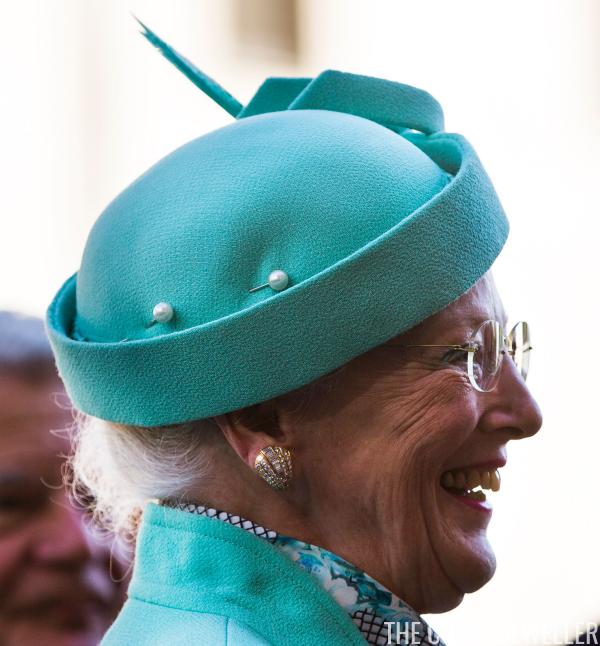 And even Margrethe's hat was accessorized with jewels: pearl-tipped hat pins were used to secure the chapeau.